I don't really think of daylilies as being wild but they are naturalized in so many places that they might as well be. We used to have hundreds of them in the goat field, until so much of it had to be dug up to put in a new leach field. Fortunately, last summer I transplanted quite a few of them. I like to use daylily flower buds in salads. 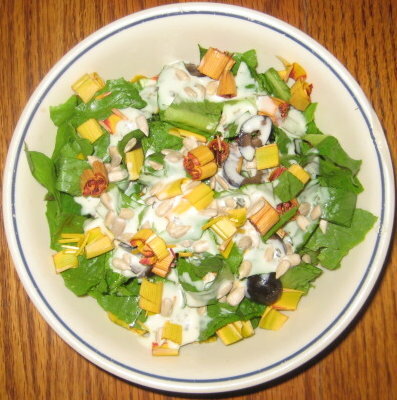 They are quite tasty, and add lovely color, especially with the Romaine lettuce from my garden. One thing new I'm trying, is dehydrating the the flowers. I'd like to add them to soups this winter. My dehydrator (an Excaliber) has an herb setting on it which ranges from 95 to 125 F. I set it on 105 for all day. The flowers aren't crispy dry, and I may experiment with several batches at different degrees of dryness. I've learned that it's possible to over-dehydrate as well as under. Over dehydrated foods just never rehydrate and cook up as well, but not dry enough will mold. There's something of an art to it to be sure. There's a lot of potential in this lovely plant. They're edible? And I use them for dyeing. Only the yellow, or does include the orange ones? I didn't know that they were edible either. I had read once that "lilies" were poisonous to dogs/cats so I just assumed they fell into the same category. I have them growing here, now you made me curious. I have a book that is on using flowers in food, I will have to blog about it soon! I guess your post proves, once again, that there is always something new to learn! Add me to the group that didn't know day lilies were edible. What do they taste like? I have only one day lily plant (but it probably needs to be divided) so at present I wouldn't have a lot of buds to use, but you sure have me curious now. I had no idea these were edible. I've got lots of them in the garden courtesy of the lady who sold the place to us. Maybe I'll mix them into my kale and garlic scape veg dish this evening? Bettina, I love nasturtiums but can't grow them for the same reason you can't grow daylilies- climate. I did plant some in the garden, but I think it's too hot for the poor things already. I've used violets and rose petals, but not thyme nor horseradish! I'm very glad to know about those, thanks! Theresa, ah yes, the deer. Fortunately we have enough so that I haven't noticed if our deer have gotten any! Benita, yes, they're edible and tasty. I've not used them for dyeing, but am curious about that as well. Scented Leaf, oh do! They are a lot of fun in a salad. My goal is to try them a few other ways too. Michelle, I don't cut many flowers either, but for some, like my zinnias, I know they need to be dead headed anyway, so I think why not? I read somewhere that a single daylily can produce up to 50 blooms per season, but if I only had a few plants, I doubt I'd cut them either. Leslie, that would be a good research project. Daylilies are Hemerocallis fulva. Turks Cap Lilies are Lilium superbum also edible but different genus and species entirely. I wouldn't eat just any lily though, for the reason you mention. Julie, please do! I would enjoy learning about that book. Mama Pea, they taste like chicken. Just kidding! Actually they have a delicate flavor, quite tasty really. Maybe you should indulge yourself just one just to see. Michelle, I've never tried zucchini flowers! Thanks for that and the link. Your stuffed zucchini blossoms look so mouthwatering! Sara, no! But now I'll have to! Katrien, that sounds yummy. I'd love to hear how it turns out! I had no clue you could eat those! WOW totally awe struck, but really cool. What can I say total city kid. A local restaurant makes some kind of appetizer with stuffed Daylilies - probably involving cream cheese or something like that for the stuffing. Phew....sorry for my big long comment! Hey, Leigh, I fear we may both have the same warped sense of humor. In my original comment I was going to be a smart-blank and ask if they tasted like chicken! Robin & Deep End, I really like learning about wild foods. I figure they're something that can grow themselves! Sue, I'm not sure about the different colors. I like the Peterson Field Guide on edible wild plants, which categorizes them by flower color. IOW, it only addresses the orange ones, which I suppose qualify as "wild" edibles. What great news about your photography. Interesting about the color difference but it sounds like your DH is well on the way to figuring all that out. Mama Pea, LOL. How could I resist? 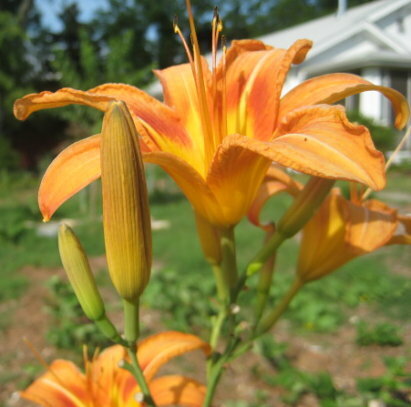 I live, blog and write cookbooks in suburban Maryland, and the deer are so voracious here I almost never get any day lilies to just admire or to put in salads. I can't imagine you don't have deer there, too. So what's your secret? Nancy, thanks for visiting and commenting. We do have deer, and saw quite a few when we first moved here, but not so many since our neighbor clearcut about 25 or so acres of land. Since then we haven't seen any nor had any damage. Actually we are not especially rural. We live just outside city limits of a small town, in a combination of subdivisions and acreage. The deer probably moved farther away to the next wooded area down the road. Along the same lines, we don't see as many hawks anymore either, which is perhaps just as well, considering our chickens. We just got back from a fortnight in Canada this morning. Driving from Peterborough to Fergus (Ontario) on Thursday, we accidentally came across Richters in Goodwood. When I lived in Ontario in the 70's I used their seeds often. Their website and published catalogue show the medicinal/culinary/dyeing properties of the plants/seeds/dried/liquid materials that they sell together with the appropriate zones that they grow in. Check out www.richters.com for lots of information. Mary, thanks for the recommendation. I just took a quick peek at their website. Looks like lots of good stuff.